Six years have passed since the winter afternoon when Hrant Dink was assassinated in Istanbul, on the wide pavement of Halaskargazi Avenue, in front of the Agos offices. Six years since he was struck down by anti-Armenian hatred. His cluttered editor’s office at Agos has remained untouched. An armoured double door was installed at the entrance. The little weekly newspaper Hrant founded in the 1990s survived him and, even better, developed, bloomed, and gained visibility. The number of its subscribers soared and the Turkish Airlines company even allowed it on its airport displays, next to Turkish newspapers – an unexpected recognition. In six years since that tragic 19th January, Turkey has changed considerably. The country gained confidence, developed economically, bristling with new towers, mosques and shopping malls. Recep Tayyip Erdogan won another two elections and tamed the army… And the Armenian question which has been haunting Turkey since 1915 has undeniably come to the foreground. A corner of the veil over the founding taboo of the TurkishRepublic was lifted, oral and written accounts as well as cultural projects now abound. Hrant Dink’s death came as a wake up shock, causing unprecedented emotion given the fact that he was Armenian. The day of his funeral, almost 100,000 people took place in the procession which accompanied the journalist to the cemetery. Huddled in sorrow, the mourning crowd was waving the now famous little black, round signs which read in Turkish, Kurdish and Armenian: “We are all Hrant. We are all Armenians”. Then again, this spontaneous response came as a surprise – a comforting one for the thousands of Istanbul Armenians paralyzed by terror – as well as a source of hope for all the Turkish democrats and friends of Hrant Dink. His death may at least have ushered some change, people then thought, in 2007. 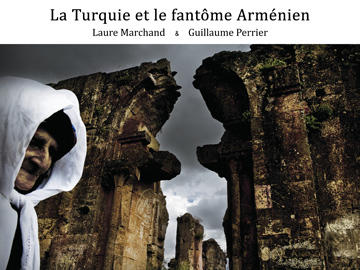 At the time, Ani and Garabet Balikçi, an Armenian couple from Istanbul had not dared go demonstrate. To tell the truth, it had not even dawned on them to do so. When you are an Armenian in Turkey, unless you have Hrant Dink’s courage and charisma, you shut up, you keep to yourself, and just lay low. Apart from a few young activists such as the Nor Zartonk movement, defenders of human rights, a handful of intellectuals and a few headstrong individuals, the vast majority of Armenians in Turkey live in a stronghold of silence and solitude. And this has not changed with Hrant Dink’s death. The Balikçi never took part in the rallies organized every 19th January in front of the Agos offices, nor in the public anniversaries of 24th April organized for the fist time by the Istanbul Human Rights Association (IDH) and by a few Turkish intellectuals in Taksim Square. However, they have felt wounded in their flesh by the murder of the Agos editor in chief. By eliminating the spokesman for Armenians in Turkey, his murderers had sent an implicit threat to the whole community – the vestiges of the two million Armenians who used to live in Turkey before the genocide. And, since 2012, Ani and Garabet have been taking part in all the demonstrations. Indeed, their family has nothing more to lose. What has changed for the Balikçi since Hrant Dink’s death is that they lost their son. 20-year-old Sevag was doing his compulsory military service in isolated barracks of the Batman district. He was gunned down on 24th April 2011, Easter day and the anniversary of the beginning of the genocide, by a fellow conscript, Kivanç Agaoglu, a young activist connected with the extreme right wing BBP party. “An Armenian assassinated on 24th April in Turkey, everyone is well aware of what it means,” an indignant friend of the family reacted over the young man’s grave in Sisli. Seva is one of the last victims of the Armenian genocide, a process which goes on as long as the horrors of the past have not been acknowledged and dealt with. Six years after Hrant, Armenian bashing had killed again. “With Hrant Dink, it made 1 500 000 million + 1. With my son, it makes 1 500 000 million + 2,” summed up his mourning mother, Ani. Just as for Hrant Dink, the authorities have tried to minimize the significance of that last murder. Pressure was exerted on witnesses and the law. “There are many similarities between the two crimes,” says lawyer Cem Halavurt, who worked on both cases. Ogun Samast and Kivanç Agaoglu, two young Turks nurtured in nationalism and anti-Armenian racism, have much in common. Ogun Samast was convicted, but as an isolated killer who had acted more or less alone. The top civil servants implicated by lawyer Fethiye Cetin were never indicted, or even questioned. Some police or intelligence officials were promoted. Governor Muammer Güler became Minister of Internal Affairs. Concerning Sevag, a military tribunal is in charge of his trial. As for Kivanç Agaoglu, he presents himself to each hearing as a free man to face his victim’s parents. The prosecutor requested between two and six years of imprisonment – which would be a very light sentence for a presumed racial crime conveying a hundred years of history. Even more shocking, the government appointed as Ombudsman (Mediator of the Republic), as position created to fit the democratic criteria of the European Union, no other than former Appeals Court Judge Mehmet Nihat Ömeroglu – the same judge who had ruled against Hrant Dink for insulting the Turkish identity as per Article 301 of the Turkish Penal Code. A clear sign that the neo-State networks suspected to have commissioned the assassination are still alive and well, benefiting from the benign protection of authorities. A sign that the ideology which targeted Hrant Dink has not relented. A series of aggressions against old Armenian ladies in the Samatya neighbourhood last winter has also bolstered this constant fear preying on Armenians in Turkey. A woman in her eighties was found with her throat slit; another has lost an eye. The authorities promptly rejected the idea of racist crimes, insisting that they had been committed by a thief. Three months after the crimes, the police arrested a suspect, an Armenian man from Istanbul aged 38. Although apparently reassuring, this resolution has not totally elucidated the cases and the arrest failed to quiet the fears of Armenians. Hrant Dink’s assassination has raised awareness in some people, but it also reinvigorated the old nationalist demons. On 24th April 2010, when some hundreds of Turkish citizens were rallying in Taksim Square, behind the rather mild message “We share in this sorrow;” strings of activists from the Workers’ Party, and others from the Alperen centres, connected to the BBP, were shouting their hatred from the other side of the square. In order to keep the two groups apart, peaceful demonstrators had been caged behind metal fences while extremists were free to come and go. It will be objected that these nationalist factions do not represent much on the electoral scene. But how much weigh do democrats and enlightened Turks carry in this debate? If, with 30 000 signatories, the “Forgive Us, Armenians” campaign initiated by a few Turkish intellectuals in 2008 did elicit a remarkable response from the Turkish civil society, what should we think of the 120,000 signatures collected in a snap by Azerbaijan to petition for the acknowledgement of the Khojaly “genocide?” “We are all from Khojaly,” “You’re all Armenians, you’re all bastards,” they chanted. The Prefect as well as the Minister of Internal Affairs brought their support to that flow of hatred widely publicized by the IstanbulCity Hall. Slogans were written on little round signs like those used for Hrant Dink – a reversal of roles so typical of revisionist outrage. This anti-Armenian demonstration, largely financed by Azeri oil dollars, confirmed what political analyst Cengiz Aktar called the “subcontracting of Armenian policy by Turkey to Azerbaijan.” Taking advantage of its steady oil and gas incomes, the Aliev regime has disseminated its anti-Armenian propaganda throughout Europe and weighed on Turkish internal politics. Resorting to blackmailing over fuels, Baku has managed to defeat football diplomacy. After the signing without effect of protocols between Turkey and Armenia, the hope for an appeasement of relations has vanished. As the centenary of the genocide is drawing close, in 2015, positions have rigidified. The slight hope that sprung from the civil response in the months and years following Hrant Dink’s death seems ever so frail today.